Diversity. Different. Varied. Contrary. Opposite. Somehow we have grown up to believe that different is bad. That the things that make us unique, or the culture we live in, the color of our skin, our religious and political beliefs, our interests and talents are all tools that keep us apart from one another. When in truth, it is what we need to bring to the table in order to learn and grow from each other. It gives spice and flavor to an otherwise very vanilla and boring world. The topic of diversity pushes at the belief that “we fear what we do not know”. And in so doing, we stay with what is comfortable, allowing preconceived ideas and stereotypes to dictate our understanding. As High School students, these young men already experience the difference of what it means when people isolate themselves, casting uneducated and uninformed ideas about people who look, act, and seem different from each other. “Everybody’s Got a Story” is a new documentary film created and directed by students AC Wilson and Will Watkins and produced by Inverted Art Mentors Chad Amour and Mark Collier. It’s focus? Diversity. Malcolm Forbes has said, “Diversity is the art of thinking independently together.” This imagery captures the essence of the film. Through spoken word, brief dance and discussion, these young men explore what it means to push against what makes us different to find our common humanity. Will said that where race is the easy and obvious answer to diversity, they want to ask their audience to reflect on a wider source of topics such as financial, religion, interests, and culture. 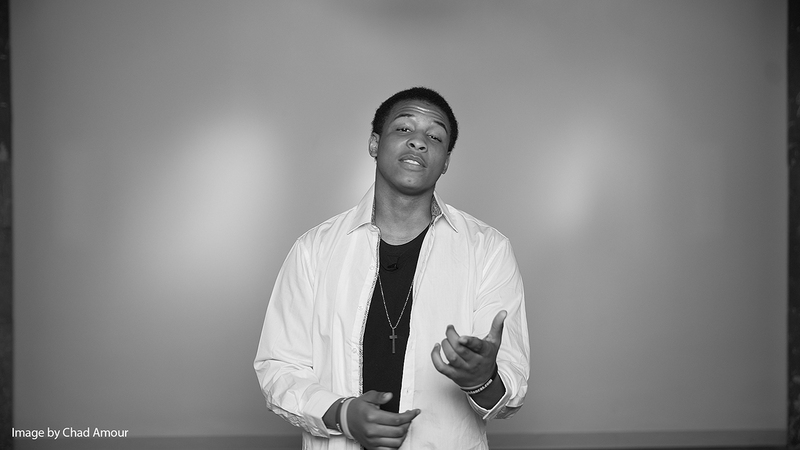 The short film uses a spoken word piece written by AC and performed by Will. It also includes a dance piece by AC and a group of High School students discussing the complexities of diversity. Diversity is beautiful in theory, but in reality, it is a delicate issue to talk about, and even harder to live out. Yet sitting down with these two young men, I could see their passion for wanting to drag this topic out in the open and create space for more of these conversations to happen. AC and Will hadn’t known each other before this project from Inverted Arts came together. AC lives in North Minneapolis, attending a predominately black school, living in a predominantly black neighborhood with his family. He said there wasn’t a lot of diversity in his world, everyone looked about the same and came from the same place. Diversity intrigued him because it really existed outside his world. Will also lives in North Minneapolis but attended a predominantly white school. He had to learn what it felt like to be different from everyone else…to wrestle with feelings of not belonging. In the film, another High School student Mohammed talks about his struggle with not feeling like he belonged in a less obvious way, because what made him different was his Muslim faith. Two talented young men, not even out of school tackle a very deep and personal topic. They show bravery and a willing openness to bring their thoughts and ideas to the table, but also to listen and learn. A balance of strength and humility. Finding their voice, crafting their talent, making art – all while exploring a new skill, filmmaking; AC and Will ask us, the audience, to try. We can learn a lot from each other if we could each try to engage with folks that are different from us. In conversation, in activity, in life. Nothing will change if we can’t even start with a conversation. If you are around the Twin Cities this weekend, I highly encourage you to go and see this inspiring film piece. The film will be screened at the Inverted Arts Studios during Art-A- Whirl weekend May 20-22, with two special screenings Saturday May 21st at 5:30pm and 6:15pm that include a Q+A time with AC and Will. The project is funded through an Arts Activities Grant from the Metropolitan Regional Arts Council (MRAC), made possible by the voters of Minnesota thanks to a legislative appropriation from the arts and cultural heritage fund.